North Korea’s Latest Launch Proves It Can Hit Guam, Kim Brags He’s Won ‘Shining Victory’ Over U.S.
Kim Jong-un has called Friday’s missile test launch over Japan a ‘shining victory in the standoff with the United States’, claiming that the U.S. is in ‘mortal fear’ of North Korea. The missile flew over the northern island of Hokkaido, where thousands were awoken by air-raid sirens for the second time in just three weeks, and landed some 1,240 miles off the cape of Erimo just before 7am local time (10pm Thursday GMT). 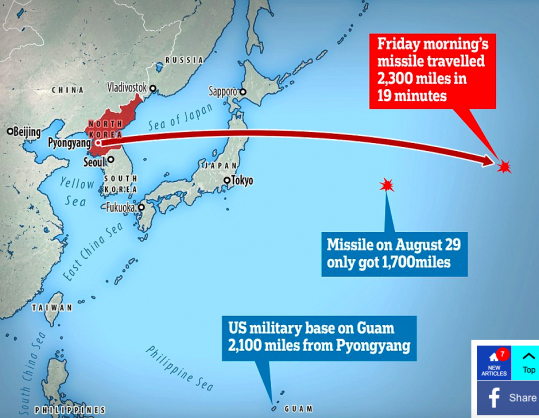 The rocket, believed to be an intercontinental ballistic missile (ICBM), flew for about 19 minutes over a distance of about 2,300 miles, according to South Korea’s military – far enough to reach the U.S. Pacific territory of Guam, which is 2,100 miles from North Korea.